Meanwhile, back on Shengri La, life hasn’t stopped. We have a new resident on the islands, Chestnut Rau. Welcome to Chestnut, I hope she enjoys her tenure with us. 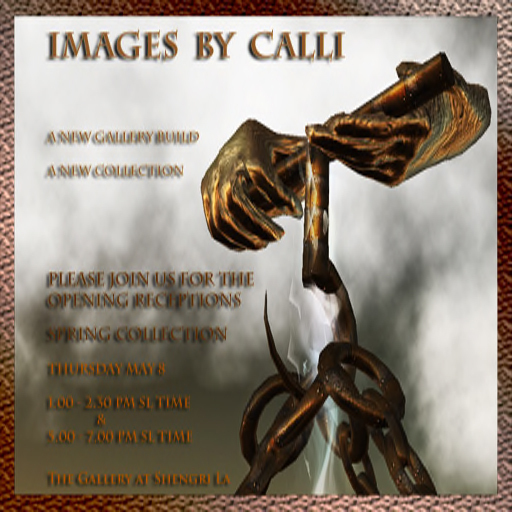 We also have several events upcoming, including the opening of Calli’s newly re-designed art gallery, The Gallery at Shengri La. Calli is our official photographer of all things Fashion Research Institute and we have been very fortunate to have her talent documenting the growth and changes of Shengri La. As an FRI collaborator and Utopian, we’re looking forward to seeing what she can do in Shengri La Spirit in coming weeks, but for now, I hope you will join us Thursday, May 8, 2008 at her gallery in Shengri La. At the very least, stop by and check out her innovative gallery design that features the carefully sculpted hands of another of our featured artists, Pumpkin Tripsa. Pumpkin’s work can be seen all over Shengri La in the form of gargoyles and mermaid sculptures. 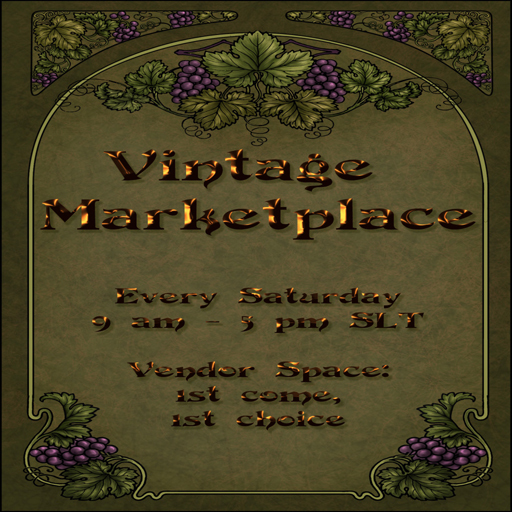 Also, on Saturdays, we have our regularly scheduled vintage marketplace, where new designers can show their work, for free. Set up starts Friday evening, prims are returned on Saturday evening at 5:15 pm SLT, and vendors are limited to 20 prims to be contained within the marketplace tents. No adult content, no BIAB, and above all, nothing that infringes anyone else’s copyright. 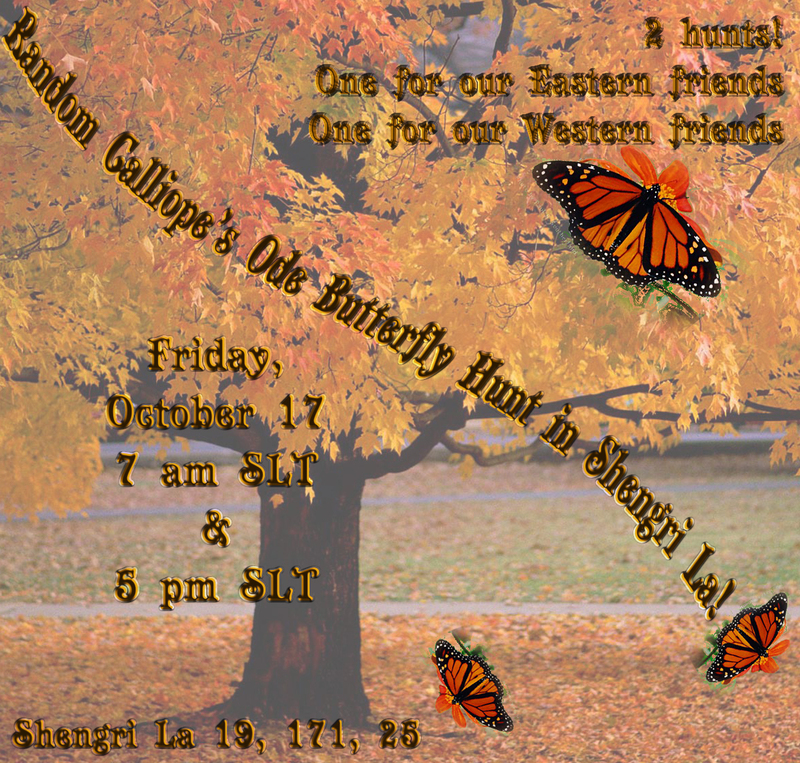 Upcoming on May 17th, we’re very pleased to host Random Calliope and his legendary butterfly hunt. Random is a longtime friend and we’re very pleased to be able to support his work by opening our five sims for this purpose. His manager, Elizabeth Tinsley, told me she’ll be releasing 5,000 Ode butterflies on Shengri La’s sim so there should be plenty for everyone. As a side note, to assist Elizabeth in setting up, we will be closing and locking the Shengri La sims (Shengri La, Shengri La Love, Shengri La Joy, Shengri La Hope, And Shengri La Peace) starting at 4:45 pm SLT on Saturday, May 17th. We will open the sims promptly at 6:00 pm SLT and the hunt will begin. Please feel free to pick up a landmark from the sims in advance of the event from one of the landmark givers. Utopians will be unable to provide limo service. 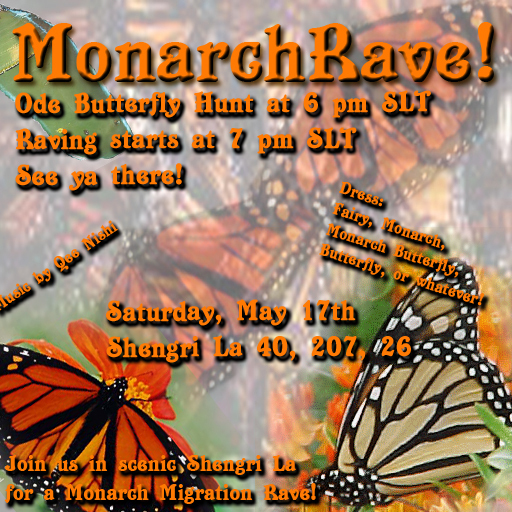 Immediately after the Hunt, we’ll be hosting a Monarch Rave, one of our irregularly scheduled events we host for our IBM technology partners and other collaborators. Please join us on the visually lush Shengri La sim for 3 hours of psytrance by DJ Qee Nishi. Raving music starts at 7 pm SLT. Dress is butterfly, monarch, Monarch butterfly, fairy, or any other cool thing you care to wear to dress to impress. Rave on in our special homage to the Monarch butterfly; visit early to the dance platform and pick up your party pack or join our event group, IBM Parties On! for up to the minute information about events we host. Also that weekend, we’ll be hosting two new artists who will be opening their shows in the Small Gallery and in one of the other galleries located on Shengri La. More about this as we are closer to the big day! More information on the Ode Butterfly Hunt: Over the weekend of May 16-18, 2008, there will be a massive migration of Random Calliope’s Ode Butterflies through Second Life. Commencing on Friday, May 16 from the Science Friday sim, the Ode butterflies will wind their way throughout SL to commemorate the opening of the North American Monarch Butterfly Exhibit at the Science Friday sim and in general raise awareness of the awe-inspiring real life annual North American Monarch Butterfly migration. Ode, and the butterfly hunts that allow one to get it, is a homage to the once very popular community butterfly hunts of days gone by. Proper gentlemen and gentlewomen would pack their picnic baskets in the spring and summer and head off to the nearest flowered field. There they would use their butterfly nets to capture prized butterflies of infinite variety. The Ode hunts are done just the same way. The community gathers in a field of butterflies and tries to catch them. They may be in trees, floating around, in the grass, or anywhere a butterfly might be found. The hunts work in this way. Pieces of Ode jewelry are put in selected butterflies and then released in a pack of decoy butterflies. There is a script contained in each butterfly that allows it to fly in a random pattern around the sim. When the hunt begins the participants need to find and click on the butterflies to “catch” them. Ode is an 8 piece jewelry set (hair piece, earrings, necklace, pendant, brooch, bracelet, ring) which at this moment has 22 color variations. The challenge is to complete full sets of one color for your Ode butterfly collection; however, Ode pieces can only be obtained through participating in Ode Butterfly hunts and/or through trading with other collectors. New varieties of butterflies are occasionally added and some variations such as the Platinum and the Shades of Golden are extremely rare. To stay informed of when the Ode Butterfly Hunts are beginning please join the Ode Butterfly Collectors Subscription group by clicking on a kiosk at either Random’s WorthWhile Gallery in Ode or the Science Friday sim.